Cope 2 was born in the South Bronx, the home, the motherland, the Mecca of hip-hop. He started writing graffiti on trains back in ‘78-‘79. In early 1982 Cope 2 started his own crew, KD (Kids Destroy). By ‘88 the subway graffiti era was dead and hundreds of writers that had been writing since day one quit and just disappeared. In the late 80’s and early 90’s Cope focused on legal walls but subways are in his blood, and he hits them from time to time. Through the 90’s he painted some of the best productions in New York, with the top crews… TATs Cru, UW, COD & FC. 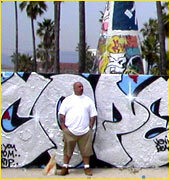 In 1999-2000 Abstract featured Cope 2 in a video documentary, “Cope2: Kings Destroy”. The video has some of the greatest rappers of all time… Fat Joe, KRS One, and writers like TKid, Ces, Chino, Daze, Ban2 and many more. He is a featured character in Sony PlayStation’s new graffiti video game, and has his own sneaker design for Converse.